Digital is at the core of the NHS Long Term Plan. Quite right too, argues Tara Donnelly, as it can be the means of moving to prevention as a priority, something that will benefit the health service and patients alike. This blog was first published here by DigitalHealth.net. 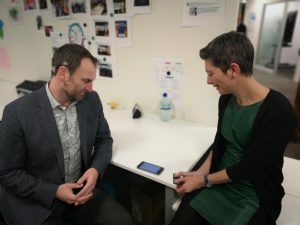 Alex Lang, AF Project Manager checks for irregular heart rhythm on our very own Medical Director, Natasha Curran, using the new range of mobile devices linked to a smartphone. This is part of the drive to prevent strokes. The 10-year blueprint for the NHS was, I think, worth the wait. Published last week, the Long Term Plan promises a major shift to prevention and supporting people stay healthy, unlocked by the power of digital. In fact, the word digital features 117 times in the 136-page document. I’ve worked in the NHS for 30 years and am a realist. I completely get how hard it can be to imagine the bold commitments taking shape when days are so busy clinically and operationally. But it is only by thinking about the longer term and investing bravely that we can make the nearer term much better for staff and patients alike. Long term conditions are a good example of the pressing need for action. They account for at least 70% of the NHS’s time and budget. Diabetes alone costs the NHS £1.5 million an hour, that’s £14 billion a year. The problem is that this spend is not currently on preventative care that will reap future benefits, or in supporting patients with great, evidence-based digital tools to enable effective self-management and keep them out of hospital. Instead, it’s almost entirely on dealing with the distressing complications of advanced disease. The plan promises to redress this balance, and to really start unlocking the power of digital. “The connecting of home-based and wearable monitoring equipment will increasingly enable the NHS to predict and prevent events that would otherwise have led to a hospital admission,” it states. Examples of devices include digital scales to monitor the weight of someone post-surgery, a location tracker to provide freedom with security for someone with dementia, and home testing equipment for someone taking blood thinning drugs. Connecting clinicians directly with patients through smart devices promises to deliver powerful benefits such as weight loss, blood glucose stability and better medicines management. The new tech will allow reminders and alerts to be sent direct to patients. This truly is remote monitoring and we know there are a good number of great digital health start-ups, many of them British, with solutions that can help in each of these areas. The next stage is the expansion of digital services for particular conditions. For example, the NHS will develop and expand the successful diabetes prevention programme to offer digital access this year. The expectation is this will be expanded to include therapies for children and young people and other modes of delivery, such as virtual and augmented reality – said to already be demonstrating success through the mental health GDE programme. Providing the option for digital outpatient care is another big commitment. Having a third of outpatients services offered this way will make a huge difference for patients in terms of convenience, travel and time off work. If this sounds impossibly futuristic, bear in mind in the highly respected and huge Kaiser Permanente health care group in California already provide over 50% of their consultations remotely. The plan says this will allow for longer and ‘richer’ face-to-face consultations with clinicians where patients want or need it, and this offers benefits. We need to recognise, however, that this will be a major piece of work, and we need clinicians and patients at the heart to design these new services more effectively. Kaiser took several years to reach this and invested markedly in supporting their staff transform services in this way and make the most of the digital opportunity. Parts of the country are ahead of the curve and beginning to offer these sorts of services already. The Academic Health Sciences Network (AHSN Network) worked with NHS Improvement last year to run a series of “digital outpatients” events in Birmingham, Reading, Manchester, Leeds and London. These brought together trusts working on digital outpatients with some of the best evidenced solutions available and sharing the learning. As Digital Health.London we also ran a collaborative in London last spring to support trusts exploring new ways of undertaking consultations including video, phone and email. Great solutions already exist to book and change appointments via smartphones too, but these need to quickly become the default not the exception. Digital will also boost the effectiveness of community staff and ambulance crew. I’m particularly glad that the Long Term Plan envisages that community clinicians will have access to mobile digital services, including the patient’s care record and plan. Paramedics will have the tools to help them reduce avoidable and costly hospital transfers. NHS staff include some of the most mobile staff groups and we need to properly equip them so they can provide great care and enjoy their work, spending as much time with patients as possible and as little on administrative tasks and travel as they can. Mobility solutions do this and are much loved in organisations that have taken this on; in south London, Oxleas NHS Foundation Trust has done this in an exemplary way. Over the next 10 years, the NHS will offer a ‘digital first’ option for most citizens according to the plan. A key milestone in this drive is the current national rollout of the NHS App. This features a simple triage offer, connection to local services, GP records, the ability to book appointments, all from a computer or smartphone. On top of this, increasingly, automated systems and AI will make these services smarter. The plan says that, over the next five years, every patient will be able to access a GP digitally and where appropriate, opt for a ‘virtual’ outpatient appointment. But to achieve these digital advances, the plan sets out a need to create the right environment and infrastructure. These include creating a secure and capable digitally literate workforce, requiring NHS technology suppliers to comply with published open standards, and making solutions commisioned and developed by the NHS open source to the developer community. There is, of course, much to do to make these ambitions a reality, but the momentum is right for this digital healthcare revolution. That’s because so many now think that digital and smart devices may well be the tools to deliver the required shift to prevention that the NHS so badly needs. This NHS Long Term Plan should be welcomed as the blueprint that sets out this brave new world. Find out how #AHSNs are paving the way for a simpler innovation system within in the NHS, supporting innovations get to patients faster than ever before. Read the AHSN Networks response to the NHS Long Term Plan here. NB: This post was updated to show that the word digital is used 117 times, which includes the number of times in the references section.